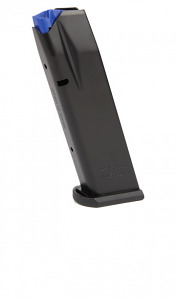 Mec-Gar 17RD magazine for the CZ-75 9mm series pistols. Increased capacity to 17 rounds and finished with a special anti-friction type coating. Will not fit Pre-B models. Mec-Gar magazines simply work great in all CZ's. Shipped quickly, works perfectly. Will buy again. Top Gun Supply is a good business that believes in the principles that this country was founded upon. God bless Brad, and God bless Top Gun Supply! Fast shipping, great communication, professional operation effectively supporting customers needs. These are well-built magazines that fit right the first time and every time after. The spring is strong enough that FTF is not a concern. I keep them loaded and ready to go. What a bargain. Excellent mags, as usual for Mecgar. Great finish, solid baseplate, smooth follower. Inserts and drops out with ease. Loads smoothly. Love these things.